[Translate] If all of you are wondering why did I go to Montebello? It’s because it’s close to Ottawa (about an hour away by car) and I wanted to be away from the city (any, not just New York). Fairmont Le Château Montebello Montebello is located on a bank of the Ottawa River with its own marina. 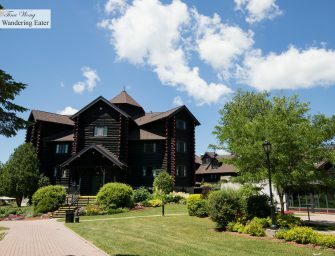 This grand log-built hotel provides rustic luxury, local flavor, beautiful grounds, great views, and heaps of activities to do for both summer and winter. It’s an annual family destination for many well-heeled Canadians (or tourist within the northeastern part of the U.S., it..